The PTOIT Poster Awards Continued! Fear Not! The Juice is Back! Where Are You, Juice? Where Are You? Late last night, a ship sailing the oceans for the last several months arrived again in my office. And on that tiny wooden replica of the Santa Maria sat my own prodigal son, The Red Fez Monkey. He has returned. Fill the streets with songs of joy. There is much rejoicing here in the office. There's been so much excitement that I haven't quite gotten all the details yet. But let me fill you in with what I know. As we last heard, Purple Fez monkey was in New York searching for his missing brother, who'd apparently left my office with no notice in order to become a model. Purple Fez never wrote to me after his first day in New York so I had no idea what had happened. But after about a week there, he met a fashion cross-stitcher who'd used Red Fez as a model. When asked about Red Fez's whereabouts, this man told Purple Fez, "He was not made for the concrete jungle. And so, he returned to his native land, The Fez Jungle, to be with all the other Fez Monkeys." With the first great lead of his epic search, Purple Fez set sail for the Fez Jungle of South America. One dark night, Purple Fez was tired of searching and set up camp. As he was searching for food, he heard a noise. A twig snapped. Thick jungle growth shook with movement. A predator was on the hunt. He did whatever monkeys do when threatened; I'm not sure what that is. It may have involved throwing feces. Anyway, out of the thick vegetation walked...RED FEZ MONKEY! The brothers embraced. After such a long search, Purple Fez was triumphant--he'd found his brother. "Why didn't you come home after you left New York and modeling behind you?" Purple Fez asked. "Because I was afraid I'd brought shame on you in not having what it took to be a model," Red Fez admitted. "With the way I left, I didn't feel like I could just come back." "But of course you can!" Exclaimed Purple Fez. "We are family. You should have never felt ashamed of your desire to be a model--or that you had to keep that ambition secret. You should have never felt ashamed to admit your failure. We've missed you and searched for you! You are always a part of Todd's office decor!" They embraced more. They picked bugs from each other's back. But then, strange sounds came again from the trees. Purple Fez braced for an attack from an unseen jungle attacker. "Don't be afraid," said Red Fez. "They are with me." With that, three Fez Monkeys swung from vines and joined the reunited brothers. "They have no real home or family," Red Fez said. "They are Fez Monkeys with no office to decorate. Perhaps they can come live with us." 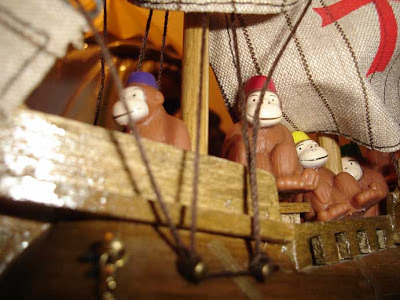 And so, a ship full of 5 Fez Monkeys arrived to my office this morning. Indeed, I may have lost one for a brief time. 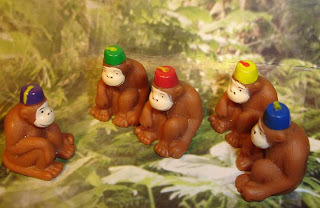 But I now have gained 3 new Fez Monkeys. And my dear sweet Red Fez is back! All is right in the world! It's a Lifetime movie waiting to happen. What a touching reunion!